"The horse with its driver approaches the Old Green House at the corner of what is now Main and Green Steets on the easterly side of Main Street, just north of the Greenwood Bridge. The house was built somewhere around 1754, and was one of two homes in the Green family's homestead. The driver and horse plodded along the road during the winter months. 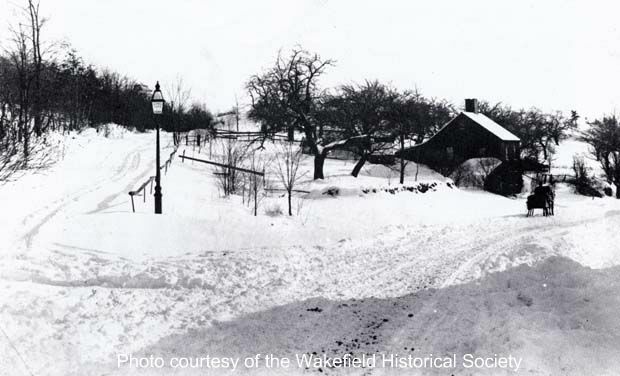 Unlike today, the streets were left unplowed and the horse and buggy cleared its own path through the snow." -- Text from calendar by Jayne M. D'Onofrio. “Corner of Main and Green Streets, circa 1880,” NOBLE Digital Heritage, accessed April 22, 2019, https://digitalheritage.noblenet.org/noble/items/show/6905.